Sel aastal Kesk Florida Eesti Selts tähistas Eesti Vabariigi 99. aastapäeva 25. veebruaril, 2017, Clearwater, Floridas. Nagu eelmistel aastatel toimus see ka sel aastal Countryside Country Club’is. Meil oli põnev ja tore kava külalistele! Meie aukülalised olid tantsijad tantsurühmast Saare Vikat. Kavas oli langenute mälestamine, maitsev lõunasöök, loterii, eesti muusikat, ühislaule, ja rahvatants. Saime kokku vanade ja uute sõpradega ilusas päikesepaistelises soojas Floridas! Kesk Florida Eesti Selts, EV99, 25. veeb. 2017, Clearwater, Florida. Foto: Countryside Country Club. 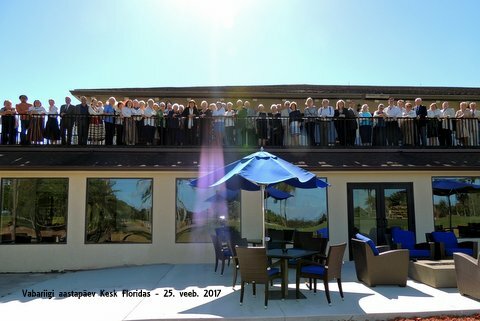 This year 50 members and friends of the Estonian Society of Central Florida commemorated the 99th anniversary of Estonia’s Independence Day on Saturday, February 25th, 2017, in Clearwater, FL. As in previous years, the event was held at the Countryside Country Club. We had a fun and interesting program to engage our guests! Our event began with champagne generously donated by Tõnu Toomepuu and a lunch enlivened with raffle drawings led by Marju Dishmey and festive group singing led by exceptional accordionist Kaie Põhi Latterner. Before lunch, our formal program began with a welcome from the president of the Estonian Society of Central Florida: Ms. Kersti Linask. Honoring the United States, we sang the Star Spangled Banner. Ms. Kaie Põhi Latterner offered the invocation. We then paused for a delicious lunch. After lunch, Ms. Linask then read greetings from the Estonian American National Council (Eesti Rahvuskomitee Ühendriikides (ERKÜ)). In a special tribute in memoriam, Monika Orumaa Craig and Markus Larsson presented Marie Under’s poem Mälestus ja Tõotus. The singing of the Estonian national anthem concluded the formal remarks in our program. Then the centerpiece of the program was offered: Eesti rahvatants! At last year’s 98th anniversary celebration, we experienced a surprise visit by the KFES dance group Talutütred, whose folkdance enchanted the audience with their spirited sharing of secrets and gossip (Tühjajutu tants). They were so well received, we decided to plan this year’s program around folkdancing, and we invited “real” folkdancers, two couples from the Estonian dance group Saare Vikat. Saare Vikat was established in 1971 in New York Eesti Maja. Dancers and directors have come and gone over the years, but its reputation for presenting high quality folk dance performances remains sterling. Saare Vikat has performed in the United States, Canada, Australia, and Sweden. Liisi Vanaselja is its current director. Today’s performers included Ivan Kavoleff, Linda Kangro, Andres Olvet, and Liisi Vanaselja. To our delight they danced Jooksupolka, Reilender, and Meremeeste Valss. To everyone’s surprise, KFES’s own dance troupe reappeared and under a more appropriate name: Rannapiigad (beach babes). Living nowhere near farms, the group decided this year to eject its former name Talutütred (farm girls) and, though more appropriate to our Gulf of Mexico setting, they rejected the seriously considered moniker Näkineinud (mermaids). Dancing barefoot as only beachgoers do, Rannapiigad (Marju Dishmey, Reet Cabrera, Anneliis Kuusik, Kersti Linask, Maare Kuuskvere, and Lisa Mets) did their best to present what is considered Estonia’s most difficult folkdance Tuljak; needless to say, there were some comedic moments. Saare Vikat and Rannapiigad joined together for the more gentle Kalamies dance. To conclude the dance program Saare Vikat and Rannapiigad invited members of the audience to dance together the Perekonnavalss. What fun! To bring the festivities to an end, closing remarks were then given by Lisa A. Mets, Honorary Consul of the Republic of Estonia, St. Petersburg, Florida. Her theme was 99: Looking back and forward. Ms. Mets thanked the members of Saare Vikat and Kersti Linask and Lisa Mets presented a bouquet of flowers to their director, Ms. Liisi Vanaselja. In this photo, you’ll see Saare Vikat (Ivan Kavoleff, Linda Kangro, Liisi Vanaselja and Andres Olvet with Kersti Linask and Lisa Mets; photo by Erkki Taada. Ms. Mets also thanked donors who underwrote Saare Vikat’s travel expenses: Leena Aare, Richard and Ann Ashley, Eric and Reet Cabrera, Heikki and Inne Joonsar, Anneliis Kuusik, Jaan and Maare Kuuskvere, Kaie Kaie Põhi Latterner, Kersti Linask, Henn and Norma Jean Rebane, Erkki Taada and Lisa Mets, Jüri and Jae Toomepuu, and Tõnu and Robin Toomepuu. Additional thanks went to Tõnu Toomepuu for his generous contribution of champagne; Reet Cabrera and Anneliis Kuusik for the lovely floral arrangements at each table; Mrs. Urve Põhi, who has become KFES’s Independence Day celebration photographic chronicler; and Evi and Arno Kallas from the Estonian Society of South Florida. Finally, with resounding applause, everyone thanked Ms. Kaie Põhi Latterner and Ms. Anneliis Kuusik, the leaders who organized our celebration and provided our musical and folkdance energy. We ended our festivities with a group photo on the balcony. Everyone’s waving at photographer Erkki Taada. It was a great afternoon. Here’s a sampling of our photos. If you are in Florida now, please continue to visit this website; we have activities planned in March and April before our summer hiatus. We’ve also begun our planning for EV100!